Many early stage investors start tracking in spreadsheets or accounting systems, but these often fall short for providing real time actionable insight. Complexity has increased as asset structures have evolved making these systems antiquated. Fintech firms like Personal Capital, Addepar, Mint have grown in popularity helping individuals manage their portfolio of investments. These solutions simplify portfolio performance and personal finance. The world of alternative investing in private equity has seen a growing number of companies applying these same principles. Investment management platform Addepar was started with the goal of providing clarity into investment options along with an actionable interface. A New York Times article points out, this company is doing its part to help wealth managers weave through the complex web of big data to analyze their portfolios. Addepar offers investors and advisors a way to quickly and accurately get a snapshot of their holdings, while funds and fund administrators can seamlessly tailor their analysis and reporting. Addepar was founded by two former employees of Palantir Technologies, a firm that helps military and intelligence agencies sort through complex data. While the big data involved in the world of investing is different from matters of national or international security, parallels can be drawn. Much in the way data can help security experts prepare for disaster scenarios, Addepar can do the same for portfolio's and throw up red flags if a portfolio appears headed for doomsday. Eric Poirier, Addepar's CEO, explained to the New York Times some of the problems confronting today's wealth managers and investors. "One of the most fundamental questions in finance is 'What do I own, and what is all of this worth?' 'What is my risk?' turns out to be an almost intractable problem," Poirier said. Seraf Investor was built by Co-Founders Ham Lord & Christopher Mirabile Co-Managing Directors of Launchpad Venture Group. Christopher is the Chair of the Angel Capital Association. This makes the pair incredibly well suited to tackle the problem angel investors, and early stage investment managers face with managing their portfolio. As an angel investors portfolio grows so do investor reports, follow-ons, note conversions, warrants, and tax deadlines. 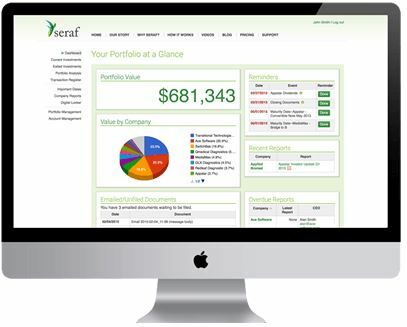 Many view diversification into a large number of companies as key to success, so as one quickly outgrows basic tools like spreadsheets and email folders Seraf is the place to turn. The solution is still fairly new so pricing is reasonable starting at $10 a month. At Fund Wisdom we review new offerings to help the early stage seed investment process. We look forward to learning about your experience with these offerings and if there are others we should cover in our comment section below.